Doing what I get to do for a living is a complete blessing and I have to give thanks to the artists that have trusted me enough along the way to sit and have on-camera conversations with me. I never know where many of the conversations will lead and thankfully, have only lost control of a few along the way. Some of the wildest moments I have had on camera were shared with one of the most talented artists in town, Ray Scott. With Scott, I never know when he is about to tell me a serious story or a hilarious joke as they are both delivered in the same rich baritone voice with a serious expression upon his face. Though I try to be prepared for those "funny" moments, Scott always seems to catch me off guard. These are the kinds of moments that we should all live for, the unexpected moments of howling laughter. Before we sat down for our conversation at this year's Country Radio Seminar on Valentine's Day, Scott posted some hysterical Valentine's Day truth on social media that immediately had me chuckling. Thankfully, Scott wasted no time sharing his views on the holiday with us on camera. As we moved our discussion to his new single and the title track to his EP Honky Tonk Heart, Scott shared a really cool story about a gift he was given by one of his fans. That is what always stands out to me with Scott. He has engaged with his fans in such a way that they have become extremely grateful and creative. Their willingness to give back to Scott even a fraction of what he has given them speaks volumes. 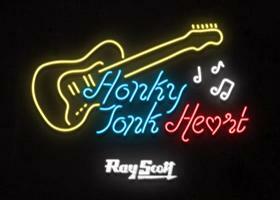 It seems a little "Honky Tonk Heart" goes a really long way and reaches deep into the souls of many. Watch our full conversation now to join in on our fun. We have shared so many great moments with Scott over the years that you do not want to miss including a recent episode of Center Stage Live at The 615 Hideaway. There are absolutely not enough colorful words in the dictionary to describe the level of crazy and borderline inappropriate entertaining chaos that ensued. Do yourself a favor and check it out now.